The biggest difference between victims of motorcycle accidents and victims of auto accidents is the severity of the injuries. Motorcyclists do not have the protection of seatbelts. They also do not have a frame to absorb the impact. 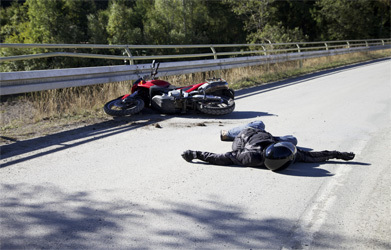 Motorcycle injuries include head injuries, spinal injuries, and many can be fatal. In the last case, the injury lawyer will be filing suit on behalf of the loved ones. An injury lawyer must also help the victim decide the amount of the lawsuit. To do so, he or she must understand how much the injuries will cost. Victims of motorcycle accidents tend to need longer periods to recover. They may also require more costly physical therapy. This amount will also include loss of income. Likewise, a permanent disability or death may mean a permanent loss of income. This will affect the victim and his family for the rest of their lives. Contributing factors can have a huge impact on the case too. The size of the motorcycle compared to the other vehicle can mean the other driver should have been more careful. However, factors such as road hazards or weather conditions might make proving fault more difficult. Also, skid marks made by a motorcycle differ from a car's. For this reason, an injury lawyer might hire someone to reconstruct the accident. Like many people, jurors may be prejudice against motorcyclists. They may think that they are all reckless. The juror may also not know anything about riding a motorcycle. A good injury lawyer will first try to prevent these people from serving on the jury. If he fails to do that, the lawyer will seek to prove to the jurors that this victim is not a careless daredevil. The lawyer will also try to educate the jury about how riding a motorcycle differs from driving a car. Jurors are not the only people who may hold prejudice against motorcyclists. Witness may too, and this can color their testimony. If a witness believes that all motorcyclists are reckless, then they will tend to describe the actions as reckless. This is human nature because people tend to "see" what supports their beliefs. It is the job of the injury lawyer to bring to light these beliefs and to help the jury see how this might influence the testimony. Without a doubt, motorcycle accidents differ from auto accidents, which is why it is important to enlist the help of an injury lawyer who knows how to handle such cases. He or she will understand the impact and the severity of the injuries. In addition, the lawyer will know how to deal with the contributing factors and people with prejudices. The lawyer's help may be the difference between a successful outcome and failure. If you or someone close to you has been injured in a Motorcycle Accident in New York, Paul Dansker & Aspromonte Associates are here to help. Contact us today online or by telephone at 800-510-9695 to speak with an experienced New York City construction accidents lawyer. Consult Paul Dansker led Dansker & Aspromonte Associates, a New York City motor cycle accident attorney will represent your best interests, and we have a much higher success right of handling the claims with a beneficial resolution for the rider and have represented thousands of clients and obtained hundreds of millions of dollars for them over the last 30 years.